On the right-hand side of the chancel floor of Great St Mary’s Church, in the centre of Cambridge, lies a small brass plaque. The Latin inscription, its obscure location and small size do not make it a very accessible tourist attraction. 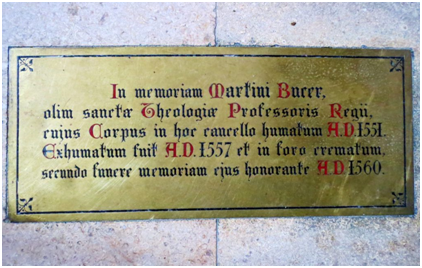 However, as X marks the spot for pirates’ treasure, so this plaque commemorates one of the most influential sixteenth-century reformers: Martin Bucer. Although Bucer was born in Germany, and spent a quarter of a century as a minister in Strasbourg, he died in Cambridge on 28 February 1551 aged fifty-nine. He was a religious refugee, did not speak English, and did not appreciate the English climate or cuisine. 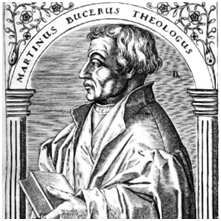 Despite these setbacks, Bucer had been Regius Professor of Divinity at Cambridge University since December 1549 (all official communication was in Latin). Archbishop Thomas Cranmer had called the German to the post, and his appointment was approved of by King Edward VI, and many other English evangelicals of the day. 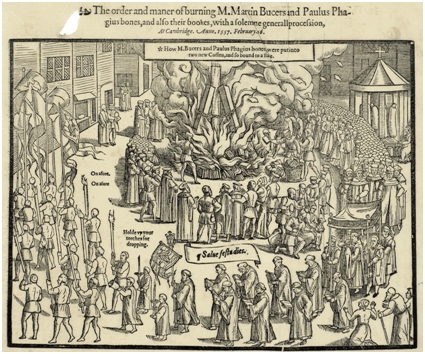 In 1556 the Catholic Queen Mary exhumed Bucer’s remains from Great St Mary’s, chained his bones to a stake in the town marketplace, and burnt them along with all his available works. This unceremonious treatment was overturned by Queen Elizabeth I in a formal act of rehabilitation on 22 July 1560 and a brass plaque was placed on the location of Bucer’s original grave. Unlike the very public memorial to Latimer, Ridley and Cranmer in Oxford, Bucer’s brass plaque is hidden from everyday sight. So it is with Bucer’s legacy for Anglican evangelicals. But it is worth pausing to consider what we owe Bucer, and why we should thank God for his life and ministry – especially this year as we celebrate the 500th anniversary of the Reformation. As the preeminent theologian of the Edwardian Church, Bucer commanded great respect throughout the kingdom. Not least amongst the students and staff at Cambridge. Having said that, historians have had difficulty in mapping out the full extent of Bucer’s influence. 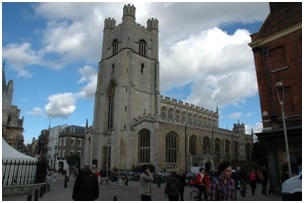 We do know that during his time at Cambridge, Bucer established intimate friendships with two future Archbishops of Canterbury: Matthew Parker (1559-75), and Edmund Grindal (1575-83). Combined with his influence on Cranmer, these connections suggest that Bucer helped shape the Protestant Church of England at a crucial stage – in its infancy, when its evangelical character was being formulated and established. Perhaps the most prominent way Bucer influenced the English Reformation was via liturgical reform. He spent 1550, among other projects and lecturing responsibilities, reviewing the 1549 Book of Common Prayer. Bucer’s Censura was a thorough critique of Cranmer’s first attempt to revise the Prayer Book. The result was a much more conspicuously evangelical liturgy in the 1552 edition. The two subsequent editions of 1559 and 1662 were by and large reiterations of the second Edwardian Prayer Book. This liturgy, along with the 39 Articles (which Bucer most probably advised on as well), gave the Church of England a confessional identity distinct from other centres of Reformed theology such as Geneva. Most importantly, Bucer was adamant that the Prayer Book reflect evangelical doctrine. For Bucer, public worship had to express scriptural truths, so that believers could encounter and engage with God within a corporate context. The whole point of church services was to provide an environment where spiritual bonds of shared fellowship in the Lord were tangibly strengthened. All liturgical practice must conform to this end. The alternative was empty ritual and human tradition that, in the eyes of the reformers, led to idolatry. In time, the Book of Common Prayer became the flagship of British religion. It was exported around the world wherever the British Empire spread. It is still being used in many quarters of the Anglican Communion today (even if some younger Sydney Anglicans have never heard of it!). On this basis, one could argue that Bucer has had a more continuous influence on Anglicanism than some of the better-known theologians of the past. 2017 is already awash with publications, conferences, and celebrations of Luther. It is unlikely that Bucer will ever have similar treatment. But we can continue to honour his legacy by considering how the shape and flow of our services is ordered to best glorify God and edify the saints. This is not a call for a return to formal liturgy; like the Sabbath, the Prayer Book was created for our benefit. Clinging to out-dated and missionally-insensitive forms of worship actually cuts against the grain and goal of the Prayer Book as outlined in the prefatory section ‘Of Ceremonies’. Rather, like Bucer, we should all (clergy and laity alike) strive for every aspect of our church services to reflect biblical truth, honour God, and articulate the faith once for all delivered. This article is derived from a longer chapter on Martin Bucer in the recently released book Celebrating the Reformation: Its Legacy and Continuing Relevance (IVP), edited by Mark D. Thompson, Colin Bale, and Edward Loane.